Update, Missing Person Andrew Baxter has been located. MIssing Person, Andrew Baxter 37years, has been located. An astute citizen recognized Andrew and notified our dispatch. Thank you everyone who may have helped us look for him! The Santa Police Department is asking for the public's help to locate a missing person. The missing person is Andrew Baxter. Andrew is a white male adult, 6'5" and 160 lbs, 37 years-old. He has brown hair and green eyes, last seen wearing a grey sweater and jeans or khaki pants. 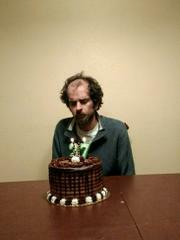 Andrew walked away from an address on W. 8th Street in Santa Rosa sometime last night or early morning. Andrew has difficulties recalling who he is or where he lives due some cognitive brain trauma. Andrew is required to take medications for his condition and the longer he goes without them, the more disoriented he becomes.